Fun, musical and unique – this Maya Bamboo Painted Rain Stick is agreat gifts for musicians, teachers, drummers and anyone who likes music! They are painted with non-toxic acrylic paint and adorned with natural motifs including the moon, turtles, stars, sun, the quetzal bird (national bird of Guatemala), monkeys, parrots and the Tikal pyramid and others designs. Guatemala has a rich assortment of traditional musical instruments and this hand-crafted Maya Bamboo Painted Rain Stick is unique and colorful. These rain sticks are made from bamboo grown in the southern coast Guatemala. The Maya Bamboo Painted Rain Stick Tall is created by Maya Kakchiquel, Joaquin Meletz, our artisan friend that makes a living creating a variety of drums, rattles and other musical instruments. Joaquin Meletz has been creating musical instruments for over 20 years. He lives in Los Encuentros, Solola Province and works at his home work-shop and continues to provide a variety of high quality musical products to Maya Color. This Maya Bamboo Painted Rain Stick makes a great gifts for musicians, teachers, drummers and anyone who likes music! They are perfect for any age, including children, grandchildren, teenagers, adults and grandfathers/mothers. Each Bamboo Rain Stick Tall is a unique and exclusive hand made; the rain stick height is approximately tall with a 9 inch circumference. They are painted with non-toxic acrylic paint. 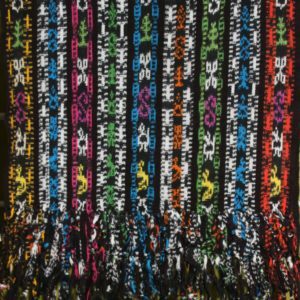 The Maya Bamboo Painted Rain Stick is adorned with natural motifs including the moon, turtles, stars, sun, the quetzal bird (national bird of Guatemala), monkeys, parrots and the Tikal pyramid and others designs. The Maya Bamboo Rain Stick Tall in filled with small pebbles and small wooden slits that creates the beautiful, soothing sounds.